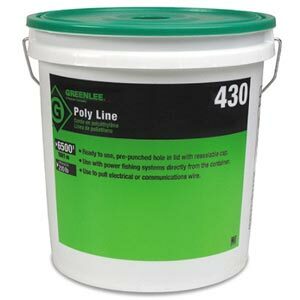 Greenlee's Poly Line comes ready to use in a bucket with a pre-punched hole in lid and resealable cap. Use it directly from the container with power fishing systems to pull rope through conduit. The rot- and mildew-resistant material resists tangling when dispensing. Handy, reusable plastic dispenser pail with handle keeps the line dry. Average breaking strength is 210 pounds (95 kilograms). Contains 6500 feet (1982 meters) of Poly Line. Oversized shipping rates apply.